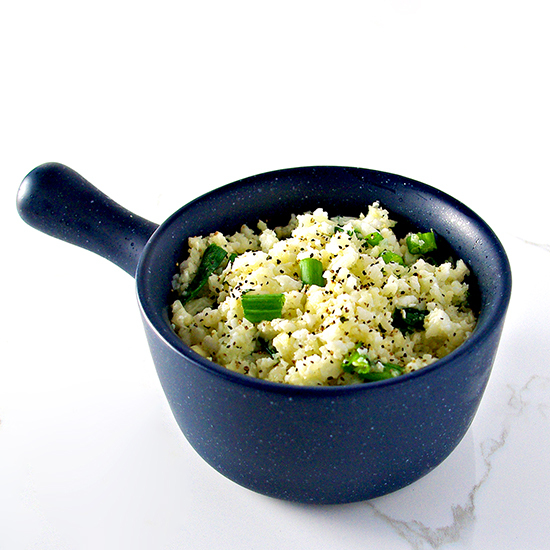 It is super-easy to learn how to make cauliflower rice! 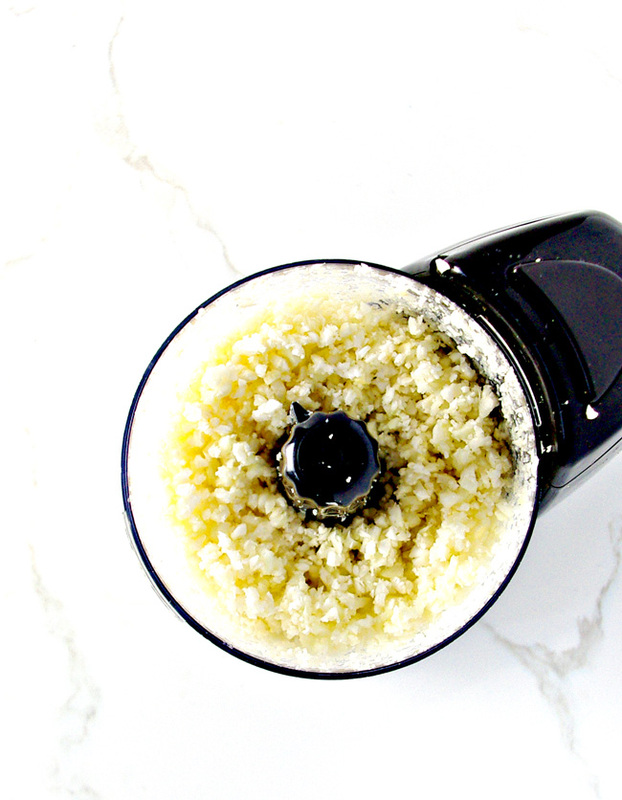 All you need is a food chopper (I use a small, dinky one), coconut oil, and sea salt, and you’re set! This recipe is a delicious grain-free alternative for countless dishes! If you’re new to cauliflower rice, then you’re in the right place. And if you want to learn how to make it, well, then you’re also in the right place. Because this post is all things cauliflower rice, and can we please just talk about how surprisingly good it is? Hand to God, I can’t get enough of potatoes, rice, and pasta. If I could subsist on potato chips and toasted onion dip, I probably would. I went (mostly) paleo when the other three members of my family had to switch their diets. And when that happened, with a few gluten-free grains thrown in from time to time, I noticed how much more energy I had. From then on, I made a more concerted effort to include veggies in my diet. But also when no one is looking I eat PB M&Ms. And Girl Scout Lemonades. Those cookies are LIT. Okay, but about the cauliflower rice. It tastes like a grain, pairs well with all sorts of mouthwatering recipes, and is really nothing more than a vegetable slathered with coconut oil and sprinkled with sea salt. It dawned on me that for all the times I have shared cauliflower rice on the blog, I put the cart before the horse by never actually making a stand-alone recipe. I mean, we have cauliflower with cilantro and lime, or maybe cauliflower with cumin, and even cauliflower with taco meat. But we don’t have just a basic cauliflower rice recipe. And that cannot stand. Especially since I have been using cauliflower rice in recipes since maybe before even the birth of this blog. 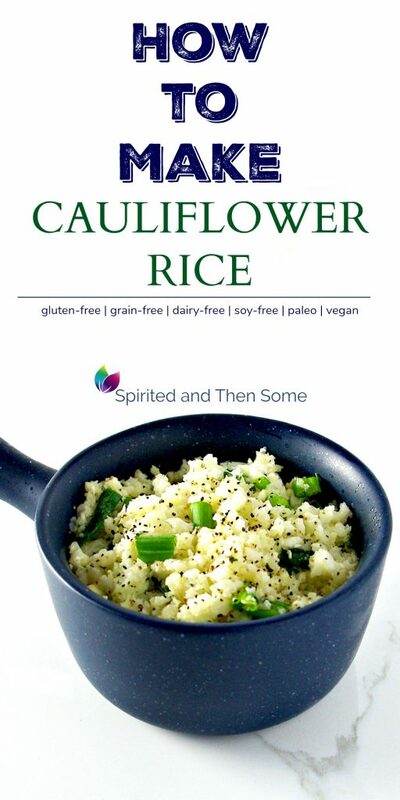 When the girls had super-strict diets, back in the day, I snuck cauliflower rice into everything I could, including loose meat hamburger and chicken recipes. Now I sneak steamed-then-frozen cauliflower florets into smoothie bowls, and the girls don’t mind. Or they don’t notice. Or both. So, basically, cauliflower is, in my estimation, one of the most versatile veggies around. And I thoroughly enjoy cooking with it. I genuinely hope you do, too! If making your own grain-free rice alternative intimidates you, have no fear. I found it easier to maneuver than learning to cook with coconut oil. I actually had to Google how to cook with coconut oil. Is it a liquid or a solid? Does it need to be refrigerated? Is the science settled on this? Who am I? What am I doing here? Does anyone know what day it is? Learning how to make cauliflower rice is pretty easy. If you’re in the mood to learn how, then keep reading. This recipe is like a rite of passage in culinary badassery. And you’re about to create your own bowl of awesome. This recipe uses just three ingredients, making it super-easy and super-versatile for any number of recipes you’d like to add it to. Cauliflower. Perhaps one of the best things about cauliflower rice, other than the taste, is that if you have cauliflower that’s just slightly past its prime, you can use it here. I have run into a few times where I pushed the envelope to far, but typically the coconut oil and sea salt, as well as the cooking process, offset a slightly earthy flavor. Coconut oil. This oil is ideal here because it coats the cauliflower rice, holds in the sea salt, and keeps everything flavorful the next day, if you’re in the mood for leftovers (and if you actually have any!). Sea salt. Normally I go super-light on the sea salt when I cook because a little sea salt goes a LONG way. 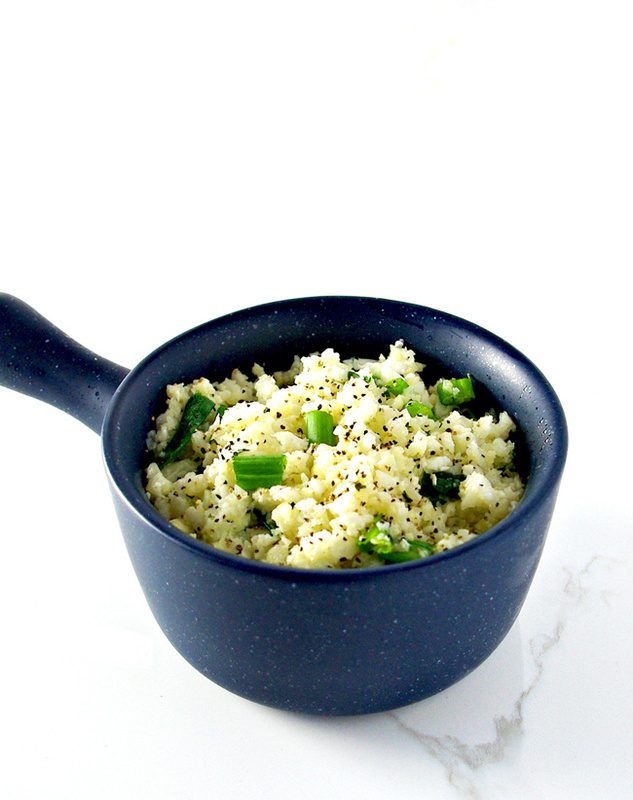 But when I make cauliflower rice, I typically work with about 1/4 teaspoon – 1/2 teaspoon sea salt. And that’s A LOT for me because I rarely go over 1/8 teaspoon. Look who’s living dangerously now????? But cauliflower and sea salt just work well together, and we need to let them live their lives. When you make your own cauliflower rice, it’s important to decide how soft you want your “rice” to be. I like mine still a little al dente, which puts me between about 5-8 minutes cooking time. For softer “rice” try approximately 8-12 minutes. The first few times you make it, taste-test as you go to determine what YOU like best. Break a head of cauliflower into small florets and trim off the long stalks. From there, continue to break the florets into even smaller pieces. The florets do not need to be uniform in size, but you may find that the smaller you can break them into pieces by hand, the easier the chopping process will be. Go back and trim off any remaining long stalks that you find. Put a handful of florets into a chopper (I just use a small $15 chopper that works just fine), and pulse quickly about 5-6 times or until the florets start to resemble rice granules. 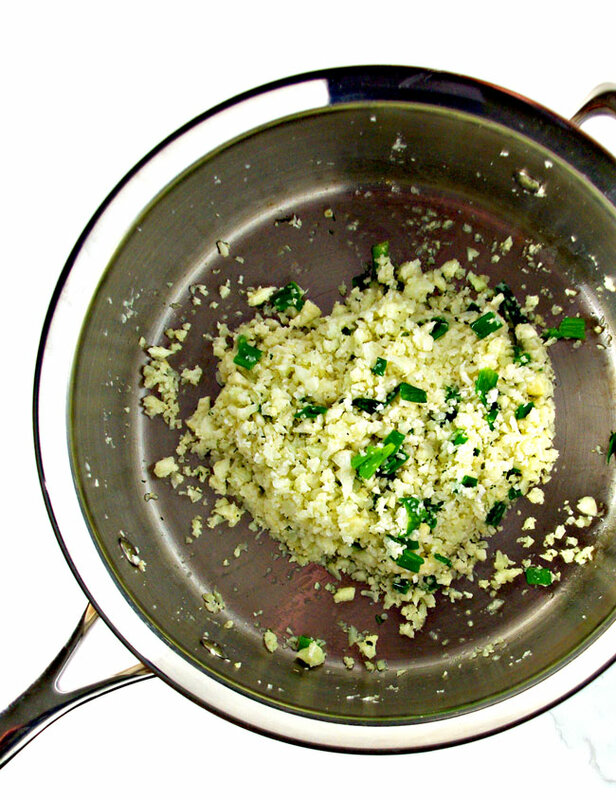 Melt the coconut oil in a sauté pan, add the sea salt, and pour in the cauliflower rice. Sauté on a medium heat for about 5-6 minutes, stirring frequently. Cook longer for softer cauliflower rice. You may find that the cauliflower cooks unevenly. If it does, cover it with a lid and let it steam for about a minute or so. If it cooks hot and starts to burn before it’s cooked through, add more coconut oil, about a tablespoon or so. Serve warm in place of rice, potatoes, or any other grain or starch you’d like. For a garlicky rice, add a few cloves of fresh pressed garlic at the start of cooking. Once you’ve made this recipe a few times and know what you prefer, the process becomes much easier. Below are a few tricks I discovered when making cauliflower rice. I have found that quick pulses in a chopper work best because the quick motions chop the cauliflower into rice-like granules without going overboard. When the florets are chopped too much, they are more likely to turn mushy during the cooking process. If you have any stubborn florets that refuse to chop, remove them from the current batch and add them to the next round. Do not over-chop an entire batch for a few pieces of cauliflower, as I have done in the past. You’ll likely wind up with a huge mushy mess. I typically have a few stubborn pieces each round, and I either add them to the next batch or set them aside and throw them all in at once for even chopping. Add sea salt in about /14-teaspoon increments. How much you ultimately add will depend on your palate and the size of the head of cauliflower you are working with. However you choose to eat your cauliflower rice, I hope you enjoy it! Learning how to make your own cauliflower rice couldn’t be easier, and this recipe will show you how! 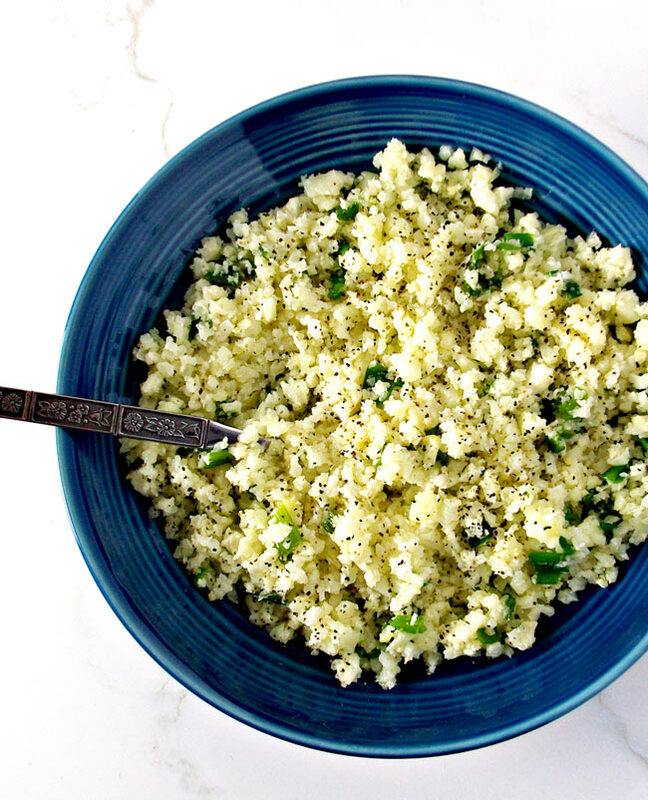 And once you’ve done it, you’ll be adding cauliflower rice to all sorts of scrumptious dishes!